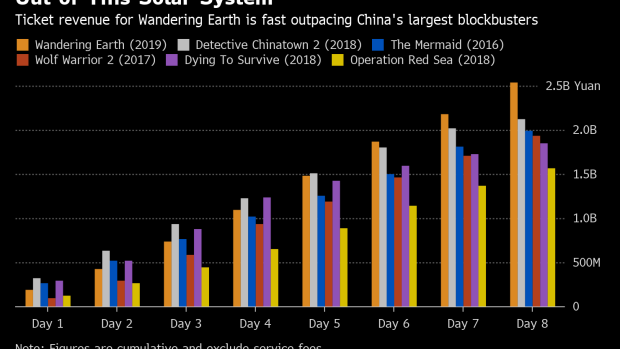 (Bloomberg) -- The post-apocalypse science-fiction production “Wandering Earth,” where humanity tries to propel Earth out of the solar system, has scored more than 2.5 billion yuan ($369 million) in ticket revenue through eight days of screenings. This eclipses the five best-selling Chinese films to date, including “Wolf Warrior 2,” which holds China’s overall box-office crown at 5.68 billion yuan during its complete run in theaters. Ticket sales through Tuesday have already made “Wandering Earth” the seventh largest hit in what is the world’s second-largest film market.